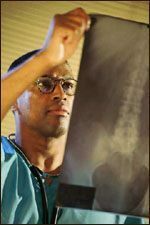 A DEXA (Dual Energy X-ray Absorptiometry) scan measures bone mineral density to check for possible bone loss. During the test, the patient lies fully clothed on a padded table while the DEXA scanner beams x-rays from two sources towards the bone being examined (usually the lower spine or hip). A radiation detector device is slowly passed over the examination area, producing images that are projected onto a monitor. A computer then analyzes the images and calculates bone density based on the amount of radiation absorbed by the bone (the denser the bone, the more radiation it absorbs).